The April assessment is usually a busy time here. It coincides with Earth Day, my wife’s birthday, and birds singing to celebrate the arrival of spring. Today is no different. The last three months have been kind of dark. Accordingly, most of my blogs over that time period have focused on the first 100 days of the Trump presidency and how the new government that he is assembling is focusing on eliminating climate change and science in general from public discussion. They appear to be doing this in a three pronged attack: physically discouraging scientists from public service in the White House and other key agencies, attempting to deprive everything that looks to be connected to science of necessary funds, and distracting public attention by advancing issues such as health and immigration to destructive extremes. What are the references that we use to compare the impacts of our decision making on the environment and how do we estimate the future impacts of what we are doing? We all remember how the Libertarian candidate, Gary Johnson, dismissed concerns about climate change by referring to the “natural phenomenon” that will convert the sun into a red giant, which will engulf Earth and indeed will put the destructive capacity of climate change to shame. The “small” detail that Johnson forgot to mention (or simply had no clue about) is that this is projected to take place in about 5 billion years – after the sun exhausts its core hydrogen fuel – while the deadly consequences of climate change are slated to take place around the end of the century, well within my definition of “now” (Micha Tomkiewicz; Climate Change – the Fork at the End of Now, 2011 (Momentum Press)). These “minor details” are important. The US, under this administration, bombed a Syrian airfield in response to President Bashar al Assad’s use of sarin gas against the civilian population in Syria, after deciding that Assad’s actions constituted a war crime. Meanwhile, the environmental impact of killing clean air regulations and the the resulting health effects on present and future populations, which promise many more casualties much closer to home, are seen as normal political events. The concept arose in landscape architect Ian McHarg‘s 1969 manifesto Design With Nature in which the modern landscape is compared to that which ancient men once lived on. The concept was then considered by the fisheries scientist Daniel Pauly in his paper “Anecdotes and the shifting baseline syndrome of fisheries”. Pauly developed the concept in reference to fisheries management where fisheries scientists sometimes fail to identify the correct “baseline” population size (e.g. how abundant a fish species population was before human exploitation) and thus work with a shifted baseline. In 2002, filmmaker and former marine biologist Randy Olson broadened the definition of shifting baselines with an op-ed in the Los Angeles Times. He explained the relevance of the concept to all aspects of change and the failure to notice change in the world today. He and coral reef ecologist Jeremy Jackson (of Scripps Institution of Oceanography) co-founded The Shifting Baselines Ocean Media Project  in 2003 to help promote a wider understanding and use of the concept in conservation policy. 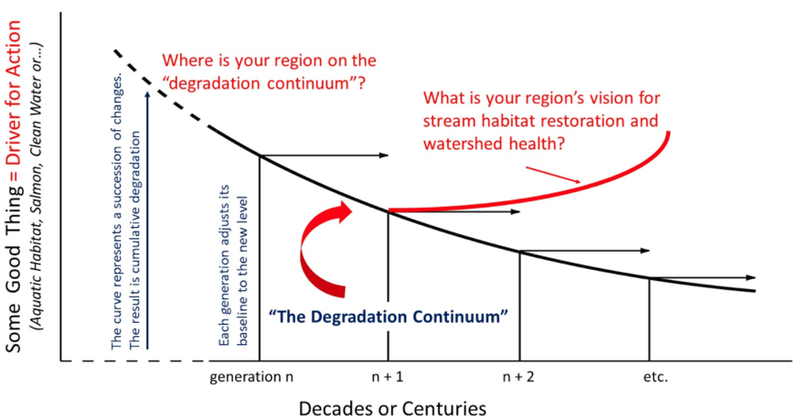 The references change from generation to generation, ultimately resulting in a complete degradation of the natural stock that could have survived without human interference. Human interference is obviously not always destructive; it can often balance natural growth through human needs. For that to take place, however, we need people to be aware of how to determine such a balance and how to regulate human impact to maintain that balance. We need the scientists. Climate change is a complex, long-term public health challenge. Older people are especially susceptible to certain climate change impacts, such as heat waves. We suggest that older people may be a resource for addressing climate change because of their concern for legacy—for leaving behind values, attitudes, and an intact world to their children and grandchildren. We review the theoretical basis for “legacy thinking” among older people. We offer suggestions for research on this phenomenon, and for action to strengthen the sense of legacy. At a time when older populations are growing, understanding and promoting legacy thinking may offer an important strategy for addressing climate change. Assessment: Since the end of December, on Twitter, I’ve gained 22 new followers, bringing my total up to 387. I also had 3 mentions, 23 likes, 10 retweets, and over 16.5K tweet impressions. On Facebook, in the same time period, my page got an additional 12 “likes” (I’m now up to 146), 97 reactions, 1 comment, 214 shares, and close to 8K impressions. To those of you reading, I thank you and (as always) welcome your comments. Please don’t forget to follow me on Twitter, “like” me on Facebook, and tell your friends to do the same. Not only do I post my newest blogs, I also share interesting articles and stories. You can also make sure you never miss any of my posts by subscribing; just click the RSS feed link at the top right-hand corner of the page. This entry was posted in administration, Anthropocene, Anthropogenic, assessment, Climate Change, Election, Sustainability, Trump and tagged Adaptation, Anthropocene, Anthropogenic, Assad, assessment, Baseline, Bashar al Assad, Biology, Carbon, carbon dioxide, Carbon Dioxide Emissions, clean air, Clean Energy, Climate Change, Climate Change Denial, Climate Change Deniers, Climate Skeptics, CO2, CO2 emissions, Coal, conservancy, conservation, Daniel Pauly, degradation, degradation continuum, Donald Trump, Earth, Earth Day, Economics, Electricity, Emissions, End of Now, Environment, Facebook, Fish, fishery, Future, Gary Johnson, generation, Global Warming, governance, Government, greenhouse gas, habitat, hery, Howard Frumkin, Ian McHarg, Jeremy Jackson, legacy, legacy thinking, libertarian, Linda Fried, marine biology, Nature, Now, oceonography, Oil, Policy, political, politics, Pollution, Population, president, Randy Olson, Rick Moody, salmon, sarin, Science, scientist, shifting baseline, spring, Sustainability, syndrome, Syria, Technology, Trump, Twitter, US, war crime, white house. Bookmark the permalink.